The real Russian Stooge was Obama ! 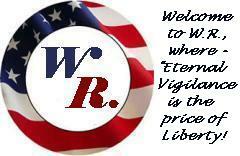 | WHAT'S RIGHT for the USA ! The real Russian Stooge was Obama ! It’s impossible to conclude anything other than that Obama was a Russian stooge. The circumstantial evidence is mounting that the Kremlin succeeded in infiltrating the U.S. government at the highest levels. How else to explain a newly elected president looking the other way after an act of Russian aggression? Agreeing to a farcically one-sided nuclear deal? Mercilessly mocking the idea that Russia represents our foremost geopolitical foe? Accommodating the illicit nuclear ambitions of a Russian ally? Welcoming a Russian foothold in the Middle East? Refusing to provide arms to a sovereign country invaded by Russia? Diminishing our defenses and pursuing a Moscow-friendly policy of hostility to fossil fuels? All of these items, of course, refer to things said or done by President Barack Obama. To take them in order: He reset with Russia shortly after its clash with Georgia in 2008. He concluded the New START agreement with Moscow that reduced our nuclear forces but not theirs. 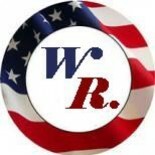 When candidate Mitt Romney warned about Russia in the 2012 campaign, Obama rejected him as a Cold War relic. The president then went on to forge an agreement with Russia’s ally Iran to allow it to preserve its nuclear program. During the red-line fiasco, he eagerly grasped a lifeline from Russia at the price of accepting its intervention in Syria. He never budged on giving Ukraine “lethal” weapons to defend itself from Russian attack. Finally, Obama cut U.S. defense spending and cracked down on fossil fuels, a policy that Russia welcomed since its economy is dependent on high oil prices. Put all of this together, and it’s impossible to conclude anything other than that Obama was a Russian stooge, and not out of any nefarious dealings, but out of his own naivete and weakness. 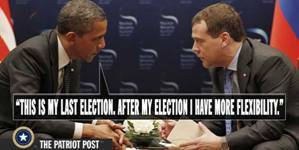 Obama didn’t expect any rewards when he asked then-Russian President Dmitry Medvedev during a hot-mic moment at an international meeting to relay to Vladimir Putin his ability to be more “flexible” after the 2012 election; he was, to put it in terms of the current Russian election controversy, “colluding” with the Russians in the belief it was a good strategy. His kompromat was his own foolishness. The cost of Obama’s orientation toward Russia became clearer during the past two weeks. When he pulled up short from enforcing his red line, an agreement with the Russians to remove Bashar Assad’s chemical weapons became the fig leaf to cover his retreat. This deal was obviously deficient, but Obama officials used clever language to give the impression that it had removed all chemical weapons from Syria. Never mind that Assad still used chlorine gas to attack his population — exploiting a grievous loophole — and that evidence piled up that Assad was cheating more broadly. The Russians eagerly covered for Assad because he’s their client. What was the Obama administration’s excuse? It effectively made itself a liar for the Russians at the same time Moscow bolstered the Assad regime we said had to go, smashed the moderate opposition we were trying to create and sent a destabilizing refugee flow into Europe. This was a moral and strategic disaster. To be sure, Donald Trump’s statements about Russia during the past year and a half have often been stupid and shameful. But there was always a good chance that Russia’s blatant hostility to our values and interests would make any attempted Trump detente unsustainable. With his secretary of state and UN ambassador hitting Russia hard over the Assad gas attack and Trump’s strike challenging Russia’s position, the administration looks to be adopting a hardheaded attitude without bothering with a doomed reset first. Even if Obama eventually got tougher on Russia — imposing sanctions after the Ukraine invasion and sending contingents of U.S. troops to countries near Russia — he never entirely shed his reflex toward accommodation. No matter what conspiracy theorists might say, there’s nothing to suggest anything untoward about Obama’s relationship with Russia. But based on the record alone, you might have suspicions.